A bill laying the foundation for a recreational marijuana industry in Connecticut cleared a committee Monday. But the flashpoint in Monday’s debate came over the issue of equity incentives for people in areas where high rates of pot-related arrests have occurred. The measure would give minority entrepreneurs advantages that include a lower fee structure and priority in the application process. The bill also would require owners of marijuana establishments who are not minority entrepreneurs to reinvest in communities disproportionately affected by the War on Drugs, perhaps by using revenue to help build schools or neighborhood centers, or by hiring people from those communities. Legislation that would erase criminal records for marijuana possession, that would legalize possession of less than 1.5 ounces of pot (by those 21 and older), and that would tax recreational cannabis are being weighed by other committees. “We have an opportunity to correct a wrong, an opportunity to correct a racist law that’s on the books that was meant to incarcerate black and Latino people,” said Sen. Douglas McCrory, D-Hartford, a member of the General Law Committee. McCrory ultimately voted against the measure, saying it didn’t do enough to ensure people of color had an entry point into the industry. Rep. Geoff Luxenberg, D-Manchester, said he favored the equity provisions, but lawmakers should consider even more remedies for people harmed by the criminalization of marijuana. Republicans on the committee took issue with the equity proposals. Witkos also pointed to statistics showing that towns like Clinton and Granby were among those in Connecticut most affected by pot-related arrests, seeking to dispel the notion that only cities were afflicted. The bill, which passed 10-8 Monday, still must be approved by House and Senate. It’s not the first time legislation seeking to legalize recreational marijuana has cleared a committee. Last year, the Appropriations Committee voted 27-24 to advance a similar bill, though the General Assembly did not take action on it. While a plan to tax the marijuana has not yet been developed, legislative leaders expect it would be close to the effective 20 percent rate imposed in neighboring Massachusetts. The Bay State adopted a 17 percent state levy on the drug – a 10.75 percent excise tax and a 6.25 percent sales tax. In addition, Massachusetts cities and towns can impose a 3 percent local surcharge. 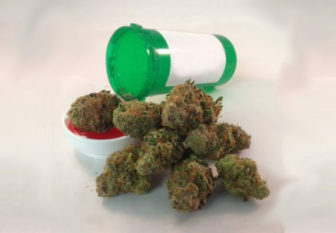 Members of the General Law Committee on Monday also greenlighted a proposal to expand the use of medical marijuana to include people who struggle with opioid addiction. The move came after fierce objection from the medical community, including the Connecticut State Medical Society. “If we’re being thoughtful about the people in the state of Connecticut, how to protect public health but also rein in some of the abuses of Big Pharma, we have to do the research and have opportunities for people to find alternative ways to manage pain,” Luxenberg said.